In 2020, you could be a passenger in a four-passenger, 200 mile-per-hour, flying taxi across Los Angeles. By 2023, this could be one of your main modes of transportation. 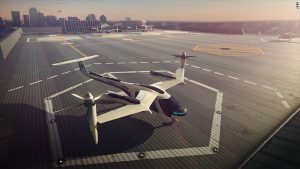 According to a Reuters article just posted, Uber announced on Wednesday that they would be partaking in a joint industry/government push with NASA to develop software which they will use use to manage “flying taxi” routes that would allow riders to hail flying taxis from the ground. Uber’s Chief Product Officer has dubbed this idea “ride-sharing in the sky.” This is a significant advance in terms of global business because Uber will be able to alleviate ground traffic while substantially diminishing travel times. Imagine the long hours it takes to travel by car, bus, or train no longer being an issue to the average business person. In the future, the ability to carry out global business would instantly become easier thanks to this advancement in intra-city travel. To provide a timeline, phase 1 was completed in 2015, during which drones used in agriculture, fire-fighting and pipeline monitoring were tested by NASA a Federal Aviation Administration site to mimic the . Phase 2 occurred in 2016 when the drones were tested over longer distances in less populated regions. Phase 3 will happen in 2018 and will mark the beginning of testing services over more populated areas. Uber will become involved during phase 4 following in March 2019, testing in high-density, urban areas. Uber plans to introduce paid, intra-city flying taxi services from 2023 and is working with aviation regulators in the United States and Europe to win approvals. Holden said Uber would start testing all of this atan internet conference in Lisbon where he emphasized it was working to win approval from aviation regulators well ahead of introducing such services. I think this is the natural next step in ride-sharing technology. It only makes sense for Uber to partner with NASA to begin software for planes, the next (and farther in the future) step is rockets. What do you think about this major advancement? Will other ride-sharing platforms follow suit? Previous Is America ready for the future of technology?